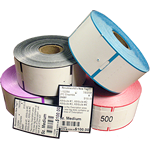 Pre-printed sticky ID labels which can be used for sticking on business cards. These labels have pre-assigned numbers with barcodes which can be used for tracking customer reward points. 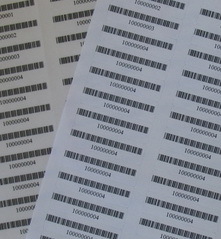 These ID labels come 80 to a sheet and include 50 sheets for a total of 4,000 ID labels. The labels are 1.75" wide by 0.5" high. The label has the membership ID barcode and actual membership ID value printed on each label. You can stick them on virtually any surface.